Sunil John is the President – Middle East & Founder of ASDA’A BCW, the region’s leading PR consultancy. He is on the global board of BCW (Burson Cohn & Wolfe) a top three global PR agency. He also leads Proof ME, a specialist design and digital marketing firm, and PSB Research ME that offers polling and research-based consultancy for campaigns in the region. 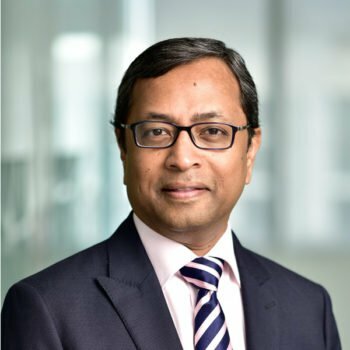 At the heart of the public relations business in the Middle East for over 25 years, Sunil founded ASDA’A in 2000 and has shaped its growth into the benchmark public relations consultancy in the Arab world, advising governments, multinationals and global & local companies. In 2008, WPP Group acquired majority stake in the firm. Sunil was the first PR professional in the Middle East to receive the Outstanding Individual Achievement SABRE Award (EMEA) from The Holmes Report, in May 2014. He was honoured with the MEPRA Fellowship Award in May 2018 and the Chairman’s Award at the Middle East PR Awards (MEPRA) in November 2016. Sunil has been the driver behind the annual ASDA’A BCW Arab Youth Survey, a unique thought leadership initiative started in 2008 and today, is one of the most widely cited pieces of public opinion research on the region by media and policymakers across the world.